Standout University of Michigan point guard who was named National Player of the Year in 2012-13 after leading the Wolverines to the NCAA Championship game. 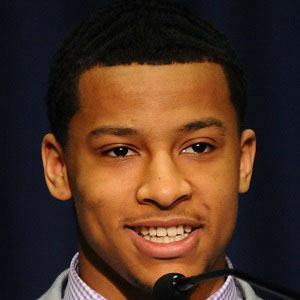 He was selected 9th overall in the 2013 NBA Draft by the Minnesota Timberwolves and promptly traded to the Utah Jazz in exchange for two first-round picks. He was named Ohio's Mr. Basketball during his senior year at Northland High School. His many honors in 2013 included the Bob Cousy Award, the Oscar Robertson Trophy, the John Wooden Award, and the Big Ten Player of the Year Award. He was also a Consensus First-team All-American. He was raised with two sisters, Amber and Amani. He had his first son with his girlfriend De'monique Chenault on June 11, 2014. At Michigan, he was coached by the great John Beilein and he played alongside guards Tim Hardaway, Jr. and Nik Stauskas and forward Mitch McGary.